TRANSFORM YOUR VIEW! OUE Skyspace LA, located in the iconic US Bank Tower, brings to life California’s must-see attraction. 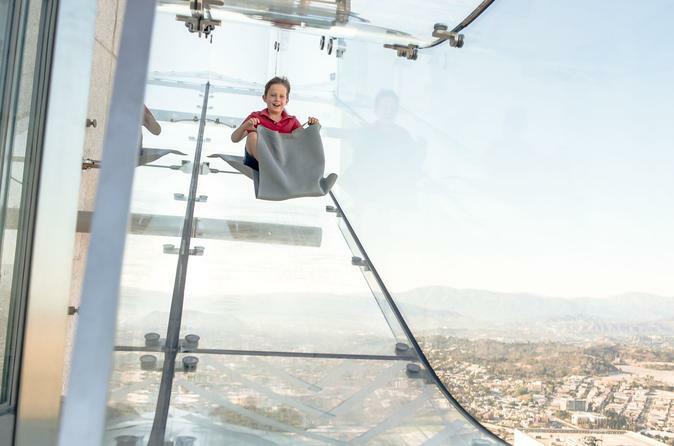 The Skyspace experience, nearly 1,000 feet above Downtown Los Angeles, boasts entertainment and excitement for audiences of any age. The unobstructed 360-degree view compliments the two open-air observation terraces, showcasing scenic landscapes from the San Gabriel Mountains to the Pacific Ocean and everything in between. Visitors can experience the thrill of the world’s first ever Skyslide, engage with an array of interactive technology and enjoy the dynamic event space. With mobile tickets, simply scan your phone for direct entry into the OUE Skyspace. OUE Skyspace LA offers visitors the chance to experience Los Angeles from an entirely new vantage point. The observation terraces are 2,800 square feet of outdoor space and feature glass balustrades to showcase the view as far as the eye can see. The Interactive Level features a variety of digital elements for guests to enjoy on their way to the top. The 360-degree LA Skyline Time Lapse captures some of the city’s most notable landmarks and neighborhoods, The Infinity Mirror creates reflections upon reflections down an old elevator shaft and the Silhouette Wall uses pixels to create reflective images based on individual body movement. OUE Skyspace LA boasts a unique and thrilling experience with the Skyslide. The outdoor slide is 45 feet long and connects the 70th floor to the east observation terrace. Visitors can view the city in a whole new light as they slide along the exterior of the tower. With mobile tickets, simply scan your phone for direct entry into the OUE Skyspace.